If you’re looking for support, an alopecia conference or camp is one of the best ways to meet others who understand what you are going through. Conferences and camps are life-changing and deeply connecting. If you are a parent of a child with alopecia, there are support sessions just for you along with activities for your specific age of children. Cost: CAP Kids are FREE along with children 5 and under. $275.00 for supporting family members, siblings over 5, and friends. Registration includes all meals and lodging. Bring your own linens, or rent some from the facility when registering. CAliPalooza is our new name. Northern and southern California CAP groups meet to bring families together in a beautiful setting. Hiking, climbing, campfires, and sessions with CAP mentors are always a big hit. Don’t forget your unicorn-themed clothing for the dance on Saturday night. Any child with alopecia attends camp free of charge. Cost: CAP Kids are FREE along with children 5 and under. $199.00 for supporting family members, siblings over 5, and friends. Registration includes all meals and lodging. Bring your own linens, or rent some from the facility when registering. 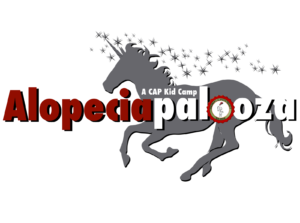 Alopeciapalooza is always a favorite camp. This year camp has a barn swing, zip lines, horseback riding, campfires, frisbee golf, a swimming pool and much more. Alopeciapalooza lives up to it’s play-on-words name by providing tons of fun. Don’t miss out on the opportunity to meet alopecia mentors, play sand volleyball, and connect with other kids living with alopecia in this great environment. Registration Deadline: Please keep your eye on this page for information about the 2019 conference in Seattle. NAAF provides specific workshops to meet the needs of conference attendees, including Child Development and Resiliency, It’s OK to feel sad, and many more. Don’t forget to check out the exhibitor displays or sign up to participate in the Tortoise & Hair race. If you are looking for an opportunity to try on a hair piece, Freedom Wigs, Joli Cameleon and more will be there to help you with the process. Researchers and bio pharmaceutical industry representatives will be presenting their latest discoveries. 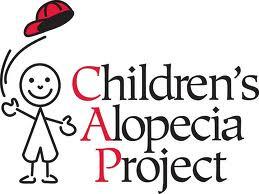 Children’s Alopecia Areata Conference Camp for ages 5-17 is throughout the weekend too. Cost: CAP Kids are FREE along with children 5 and under. $199.00 for supporting family members, siblings over 5, and friends. Registration includes all meals and lodging. Bring your own linens. The lake has boats, canoes, and kayaks for your enjoyment. Conquer the challenge course, with a 25′ climbing wall, 11-element high ropes course, double zip line, and giant swing. There may be horseback riding too. Camp Willson is centered around a natural spring-fed lake formed during the last glacial period in Ohio, 14,000 years ago. 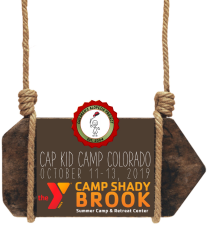 This is the 2nd year for CAP Kid Camp Colorado, and it will be another exciting one. You will learn outdoor survival skills, go on nature hikes and a Night Watchers night hike. Water exploration and archery will be a few more of the fun activities planned. Cost: CAP Kids are FREE along with children 5 and under. $249.00 for supporting family members, siblings over 5, and friends. Registration includes all meals and lodging. Bring your own linens. This is the first year for the PNW Cap Kid Camp, and we are super excited to be having it in the beautiful San Juan Islands. Dress warm for the fall weather, and get ready to explore all that camp has to offer. Camp Orkila is on the water and looks out to President Channel and the Canadian Gulf Islands. Most of Camp Orkila’s 280 acres are preserved forest with hiking and horse trails. The cabins range from open air to full duplex style housing near the conference center. Registration Deadline: We are looking forward to having another great family-filled fun weekend. For ages 16 and under. 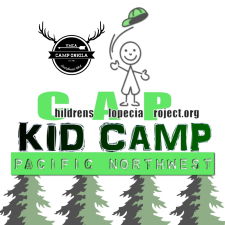 Camp is tailored for children, with a focus on helping children come to terms with their alopecia. The wild west theme is the perfect setting for children to meet new friends and understand they are not alone.